Notre Dame has one of the best ’18 recruiting classes in the country so far. The Irish have the #4 ranked 2018 recruiting class in the country thus far. 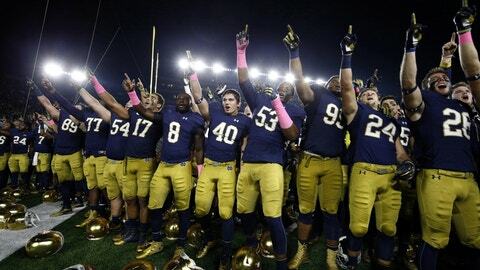 Let’s look at the 6 talented athlete’s who have given Brian Kelly their pledge. When you start your recruiting class with a 5 star/high 4 star dual-threat quarterback, you have to feel good about where things are headed. Phil Jurkovec committed to Notre Dame on May 16, 2016 over offers from the likes of Alabama, Clemson, Ohio State, Penn St., Tennesse and most strong Power 5 programs. Soon after, he was asked about how strong his pledge is to the Irish. Jurkovec tore a ligament in his throwing-hand thumb in a contest against David Adams and Kurt Hinish’s Central Catholic during the 2016 season. He finished the game but was finished for the season. In his sophomore season and what he played of his junior season, the Army All-American combined for 4,233 yards passing for 32 touchdowns and only 6 interceptions. He also rushed for an amazing 1,731 yards and 11 touchdowns. Jurkovec leads the Pine-Richland Prep offense with great control. His footwork, throwing mechanics and ability to keep his eyes down field and throw on the run are extremely advanced for a kid his age. Jurkovec needs to add a little weight to his slender frame and continue to develop as a passer. That being said, his skill set is very polished and he should arrive at Notre Dame as a quarterback who will get starting consideration as a true freshman. Dynamic Running Back and Notre Dame’s lead recruiter Markese Stepp holds offers from Georgia, Miami, LSU, Michigan and many more. Not that it matters as I don’t think I’ve ever seen a more solid commit than him. Stepp committed during last years Irish Invasion camp. Stepp works hard daily on academics, the weight room and on Twitter, recruiting top talent all over the nation to Notre Dame. This can be a very important thing for a program. With Phil Jurkovec and Markese Stepp in this class joining a program with one of the most talent loaded offensive lines in the country, Notre Dame is building something truly dynamic with their offense. Stepp suffered a hamstring injury last season. Through 8 games in his sophomore year, he rushed for 888 yards on 104 carries, good for 8.5 yards/carry, and 12 touchdowns. Running behind a stout offensive line at one of the best prep programs in Indiana, Stepp runs fearlessly with great acceleration and breakaway top-end speed which is rare for a back his size. Expect Markese Stepp to be a dynamic running back for the Irish. 114 tackles, 22 tackles for loss, 12 sacks, 2 forced fumbles and 1 interception. Those are darned good stats for a sophomore inside linebacker who plays in a very competitive Pennsylvania prep division. Not only is Bauer a fair sized, tough as nails mid-west linebacker, he’s also very athletic. He also excels at baseball which he was hoping to play as well at Notre Dame. Brian Van Gorder, who was the defensive coordinator at the time they started recruiting Bauer, told the talented linebacker that he needed to make the decision to play only football if he wanted to play for the Irish. Bauer mulled it over and decided he was willing to focus on football only. The offer came right away. He commited to Notre Dame over offers from Penn St., Michigan, Michigan St, Ohio State, UCLA and many others. What impresses me the most about Bauer is his quick instincts and how fast he then closes on the ball. He has impressive speed with lightning quick pursuit and takes efficient angles. When he gets to the ball, he delivers the hit with authority. Bauer covers ground quick enough to allow him to be effective in pass coverage as well. He projects well at both linebacker spots at the college level, given his ability to fill, cover ground laterally and provide effective pass coverage. Notre Dame has a major need for pass rushers in the ’18 class. Luckily, they landed Justin Ademilola early on, taking the pressure off of Mike Elko as they’re off to a good start. Justin and his twin brother, Jayson, are enrolled at St. Peter’s Prep, Brandon Wimbush’s alma mater, which is one of the best prep football programs in the north-east. The twin brothers chose Notre Dame over offers from Ohio State, LSU, Michigan, Clemson, Alabama and plenty more. Justin Ademilola had a very productive junior year. He racked up an impressive 83 tackles, 15 tackles for loss, 10.5 sacks and 20 QB hurries. On tape, there’s a lot to like. He shows extremely good bend and burst off the line. He’s clearly getting some high-level coaching on pass rush skills as it’s evident in his junior highlight film that he has elite talent in that regard. He has the strength to engage the offensive tackle then uses strong hands to shed the block and get around the edge. He also has great speed to flat-out beat the tackle around the edge at times. When he gets to the backfield, he closes on the ball very well and doesn’t fall for the juke and jive of the ball carrier. He keeps his pad level low and tackles efficiently often with force. How sweet it is for Brian Kelly to have landed twin brothers that fill two big needs on his defense? Jayson Ademilola put up dominate numbers against stiff competition in his junior year – 86 tackles, 23.5 tackles for loss,11.5 sacks, 2 forced fumbles and a fumble recovery. 23.5 tackles for loss is very impressive. Notre Dame will benefit greatly from having a disruptive force in the interior of their defense to go along with ’17 crown jewel Darnell Ewell. I could see the two of them being a nightmarish combo for opposing defenses for years to come. What excites me the most from Jayson’s film is his ability as a pass rusher. St. Peter’s Prep plays in a very competitive league and their coaching staff does a great job of putting Jayson in position to make plays. They line him up at defensive end and he shows great pad level and ability to beat blockers with strength as well as an arsenal of pass rush moves. He has long arms that he uses to create separation and to bat down balls. Jayson Ademilola also has quick feet which allow him to change direction and close in on ball carriers. He’s a punishing tackler with great form and wraps up well. Many large high school defensive lineman rely on their size to knock down call carriers but don’t wrap up. Jayson does. Although the twins have received offers from many of the top Power 5 programs, including SEC teams, it seems they are quite firm in their commitments to Notre Dame. I’d personally be shocked if they ended up anywhere other than South Bend. Notre Dame is very excited about this kid. Ovie chose the Irish last Summer over offers from Michigan, Michigan St., Louisville, Kentucky and many more. “That’s a big catch for Notre Dame….If Michigan or Michigan State offered, he has to be pretty good. They don’t mess around in their own state unless they really want a kid,” said CBS Sports recruiting analyst Tom Lemming as reported by NDinsider. Oghoufo, who also excels as a receiver for Harrison High School, was visited recently by Notre Dame’s new linebacker coach Clark Lea. Former Defensive Line coach Keith Gilmore was his area recruiter so it was important for Lea to make a connection. Current Notre Dame defensive end Khalid Kareem is a Harrison High School grad and knows Oghoufo. NDinsider explained that Kareem played a part in Oghoufo’s recruitment. “I definitely looked up to him when he was in high school….He kind of got this whole recruiting thing started for me. He played a big role. The connections you receive at Notre Dame are unquestionable, and he made me realize that,” Ovie Oghoufo explained. What stands out to me about Oghoufo is that he not only shows elite athleticism, he’s also quite versatile. He could become a very effective pass rusher as well as efficient in coverage. Because of this, I could see Oghoufo possibly becoming a rover in Elko’s defense. It all depends on how he develops. Keep an eye on him during his senior season. Click here to read NDinsider’s article regarding Oghoufo’s commitment. That wraps up Notre Dame’s ’18 commits. They’re off to a great start. Stay tuned to SlapTheSign.com for updates, reviews and analysis on Notre Dame’s ’18 recruiting scene.